Wish-Rumble’s plan was to separate everyone into their own stand-alone stories, meaning everyone is all alone. Although Zelena is on the Nautilus and hates fish. However Regina uses her love to save Henry from the darkness that would makes Wish-Rumple’s plan happen. In the process OGRumble destroys Wish-Rumble by giving his heart to Wish-Hook which cures him of the poison. Not sure HOW THIS WORKS! But methinks the creators don’t either so just go with it. Anyway Rumble dies and reunites with Belle, Happy ending for Rumbelle. Then Regina cast a “curse” that brings all the realms together so all the wish people, all the other story realms, all the time-travel stuff all live in Maine. Now try, TRY to figure out the timelines and who is who. For some characters there are three versions of them. For instance Henry; there is Storybrooke Henry, Wish-Henry and Adult Henry. WAIT! If all the realms are merged that means Henry doesn’t go to the Other Enchanted forest to meet Ella and therefore Lucy shouldn’t exist. Also if all the realms are merged would THAT mean Rumple and Belle would be back in Storybrooke since future Rumple and Belle died but technically canonically in the timeline they would have been traveling around the Enchanted Forest with Gideon? But you’re not supposed to think of about it too much, just go with it. Another thing they added that was pure fan-service was the dialogue about Lily’s dad being Zorro. WTF! Sure, I like everyone (I assume) wanted this addressed but a one line about Zorro being a dragon feels like a diss and a tease. Also speaking of tease was Henry being Rumple’s undoing, since they made us recall the seer from season 2 in the last episode. I guess yes since Wish-Henry stopped Wish-Rumble’s plan but really it was OGRumble that stopped Wish-Rumble. Anyway let’s talk about the big ending. 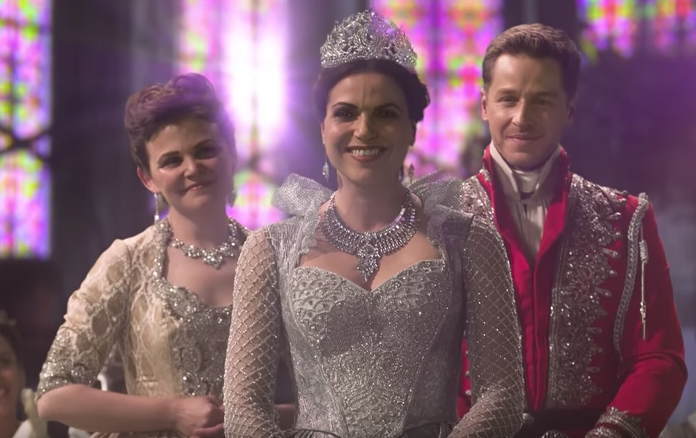 With all the realms united Regina is electived the Good Queen to rule them all. I guess Storybrooke takes after Naboo with electing Queens. The show teases about why Emma isn’t there only to have Emma shows up with her baby and a meta line about how she wouldn’t miss the event. Though Hook baby-proofing his hook was cute. AND AGAIN timelines and ages on these kids makes no sense but then again JUST GO WITH IT! Anyway this was a fine ending for Regina, she gets her happy ending or her second chance. Regina’s and Rumble endings are both great and fitting for their character but the sloppiness of getting all that fan-service and timeline brought the series finale down. Then again if you just go with it and not think too deeply it’s fine, it’s all fine.